Going strong since 93! 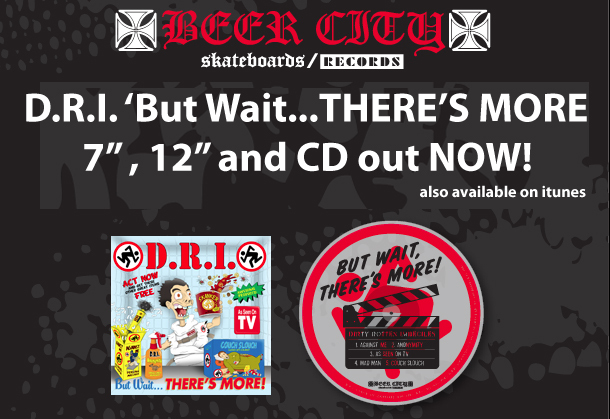 This is the official mailorder for everything that is made by Beer City as well as some other skateboard accessories we sell. 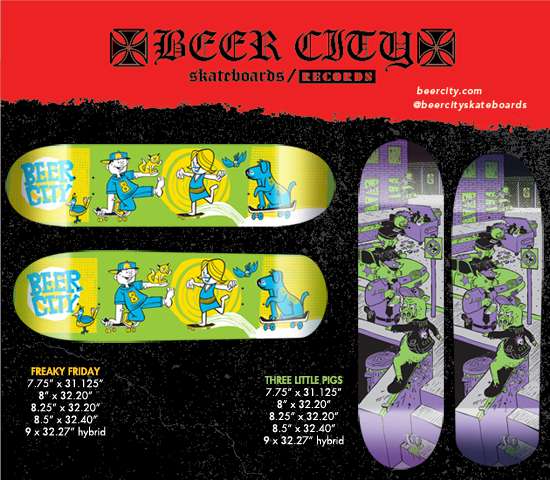 (04_01_2019) Beer City  Spring 2019 deck line out now! Smiley and Davey have brand new graphics and larger wheelbases! Shaggy has a new graphic and a brand new hybrid shape. Our Shovelnose/head shape now comes in sizes 8.25 all the way up to 10. With wheelbases going up to 15.5"! All MADE IN THE USA! You can check them out and order them right here. (02_04_2019) D.R.I. Beer Koozies out now! Keep your beer icey cold with these D.R.I beer koozie's. The logo is printed on each side and they come in three colors. You can order them right here. (12_10_2018) Beer City -Trucker / mesh caps now available! Beer City -Trucker / mesh caps now available! You can order them here. (11_08_2018) D.R.I.- 24 oz handcrafted beer stein! We just came out with the first ever D.R.I . beer stein. Its 24oz and handcrafted in the USA. You can get it at by clicking this link. Hurry thought cause there is only 43 of them! (09_24_2018) Beer City Fall deck line out now! Smiley, Shag , Marty and Davey Rogers all have pro models! The 8-ply is back to! Plus theres two new team decks! ALL MADE IN THE USA! oClick here to buy . You can even download the catalog by clicking here . (06_21_2018) In the Pit decks out now! 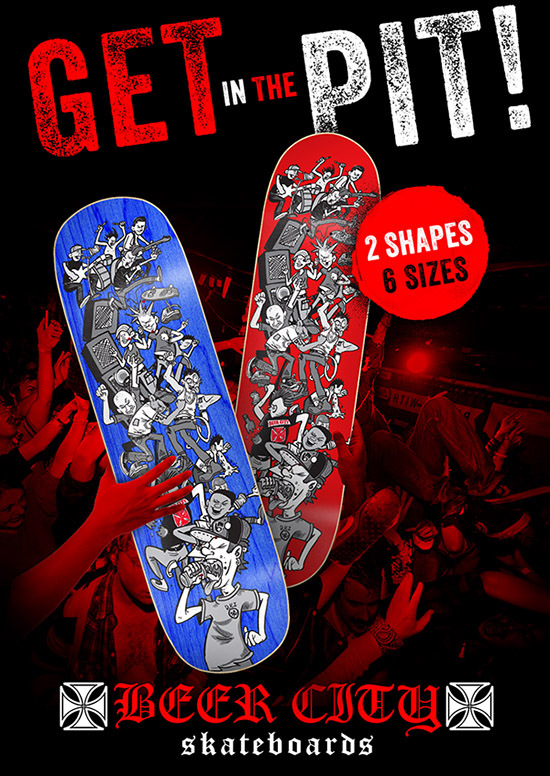 Our brand new 'In the Pit' decks are now available in several sizes and two shapes.Just click the image below to order. 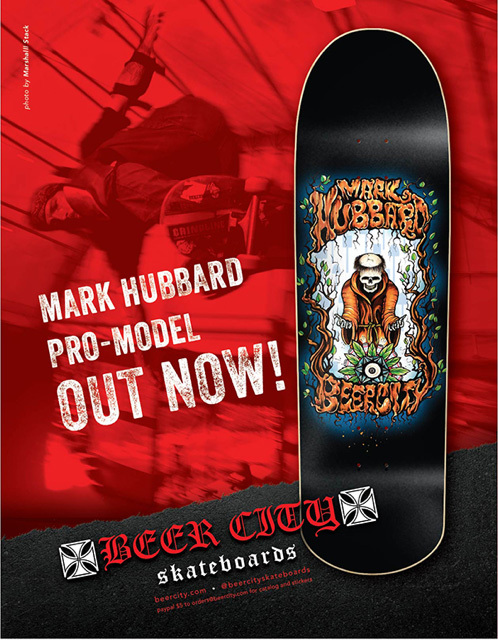 (06_14_2018) Beer City skateboards - Mark 'Monk' Hubbard's pro model out now. From Hubbard's family. "The Hubbard family wishes to donate their proceeds of the sales to the skaters of The Oglala Lakota Nation in the form of skateboards. Monk was made an honorary member of the tribe while building the Pine Ridge skatepark alongside the locals and tribe. This park will forever be one of Mark's proudest contributions. " 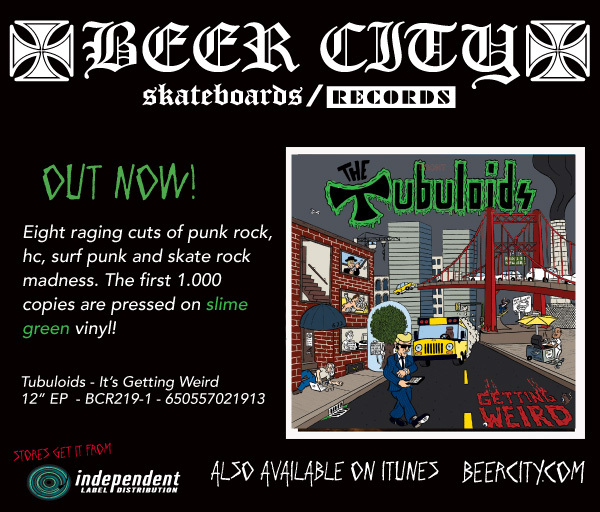 In addition Beer City will also be donating skateboards to the tribe. Just click the image below to order it. Graphic concept - Mark Hubbard , art - Chris Adams , production - Tim Chiappetta. RIP Hubs; you made the world a better place. 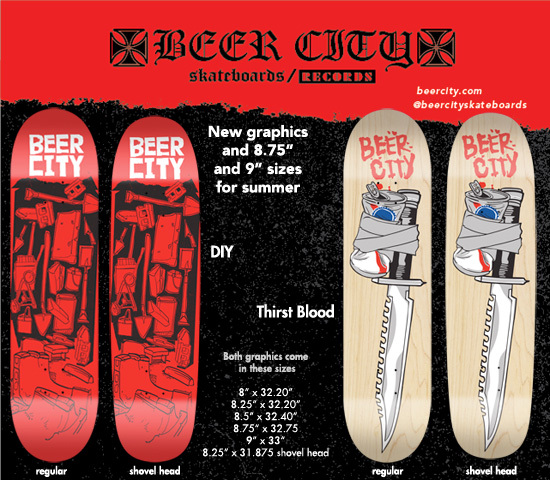 (06_19_2017) Beer City skateboards - New Graphics/shapes for summer 2017! Just click the image below to order. 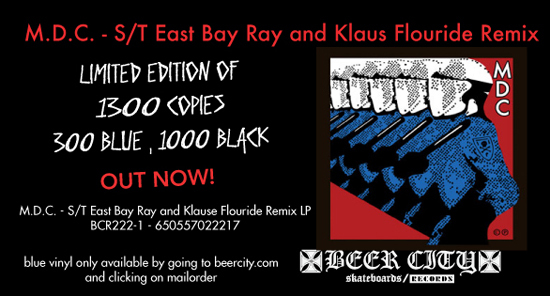 (06_09_2017) M.D.C. - S/T "East Bay Ray and Klaus Flouride Remix" LP out today! 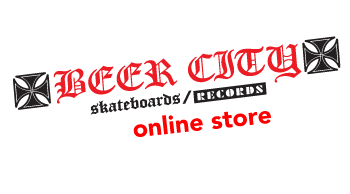 (05_01_2017) Beer City spring decks now out. (03_01_2017) Pre order D.R.I. 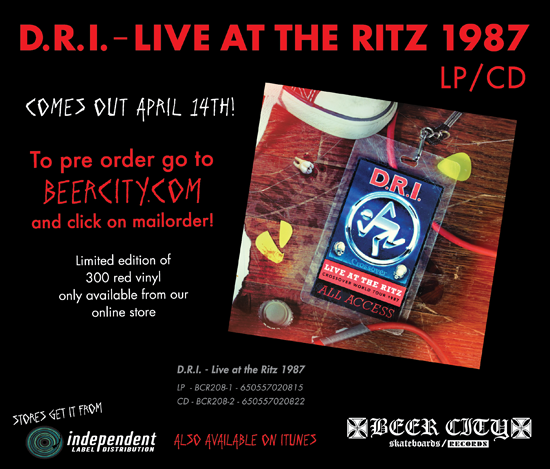 -Live at the Ritz 1987 LP/CD! Just click the image below to order and hear a teaser. (01_06_2017) 24 years = 24% off sale - ends Tuesday at noon central time! In celebration of Beer City turning 24 we are having a 24% off sale. There is no limit you can buy as much stuff as you want. no codes or coupons needed. Just fill your cart and when you checkout you get the 24% off everything you bought. Hurray cause the sale ends Tuesday at noon central time. 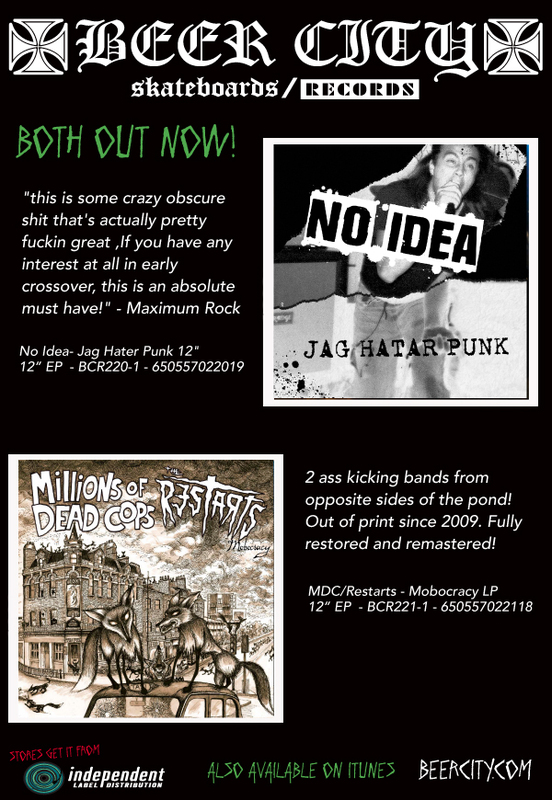 (11_28_2016) MDC/Restarts - Mobocracy LP and No Idea - Jag Hatar Punk 12" out now! (10_14_2016) Tubuloids - It's Getting Weird 12" E.P. out now! 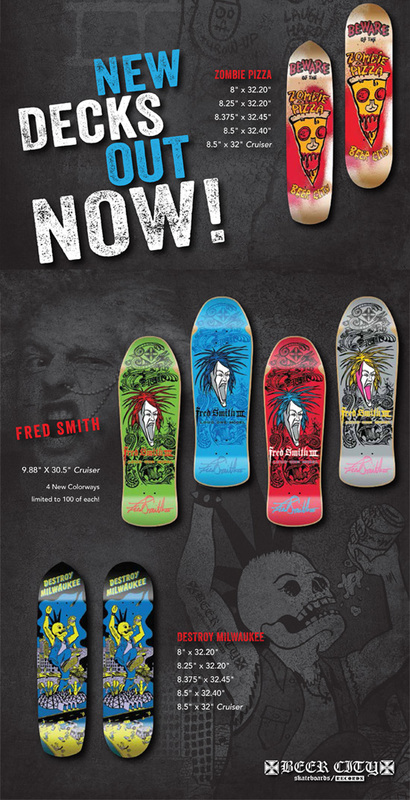 (08_17_2016)New graphics and Fred Smith colorways out now!Just click the image below to order. 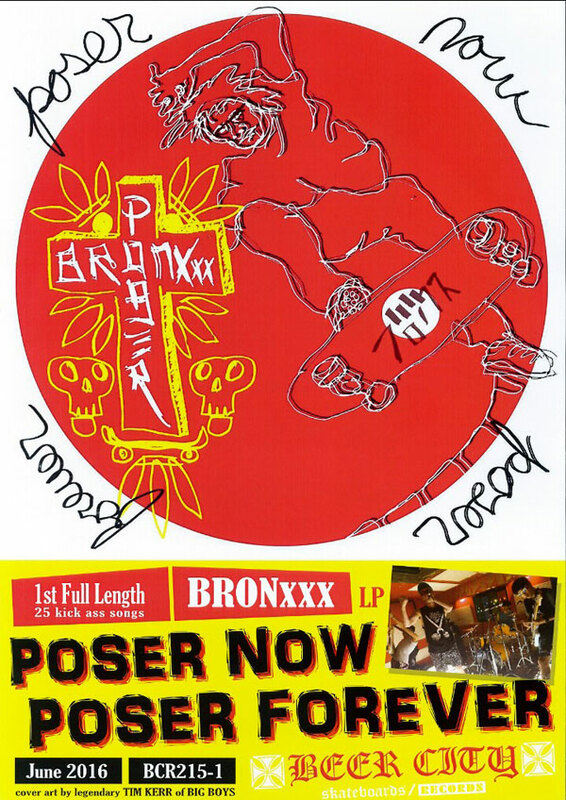 (06_21_2016)BRONxxx - Poser Now Poser Forever LP out now!. Just click the image below to order. (06_13_2016) Beer City -New P.G. Allin graphic plus new shape now out!. Just click the image below to order. (06_10_2016) The new D.R.I. EP out now. Just click the image below to order. go out that same day except on holidays.